Getting to the bottom of the Jamal Khashoggi disappearance is a bit like peeling an onion. It is known that Khashoggi entered the Saudi Arabian Consulate in Istanbul on October 2nd to get a document that would enable him to marry a Turkish woman. It is also known, from surveillance cameras situated outside the building, that he never came out walking the same way he entered. The presumption is that he was either killed inside or abducted, though the abduction theory would have to be based on a Consulate vehicle leaving the building with him presumably concealed inside, something that has not been confirmed by the Turks. If he was killed inside the building and dismembered, as seems likely, he could have had his body parts removed in the suitcases carried by the alleged fifteen official Saudis who had arrived that morning by private jet and left that afternoon the same way. 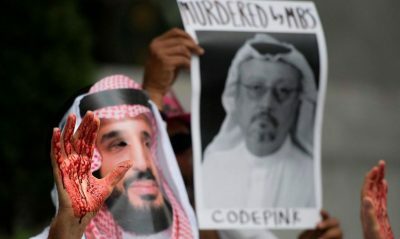 The supposition is that the fifteen men, which may have included some members of Crown Prince Muhammad bin Salman’s bodyguard as well as a physician skilled in autopsies who was carrying a bone saw, constituted the execution party for Khashoggi. There are certain things that should be observed about the Turks, since they are the ones claiming that the disappearance of Khashoggi may have included a summary execution and dismemberment. The Turkish intelligence service, known by its acronym MIT, is very good, very active and very focused on monitoring the activities of foreign embassies and their employees throughout Turkey. They use electronic surveillance and, if the foreign mission has local employees, many of those individuals will be agents reporting to the Turkish government. In my own experience when I was in Istanbul, I had microphones concealed in various places in my residence and both my office and home phones were tapped. A number of local hire consulate employees were believed to be informants for MIT but they were not allowed anywhere near sensitive information. As Turkey and Saudi Arabia might be termed rivals if not something stronger, it is to be presumed that MIT had the Consulate General building covered with both cameras and microphones, possibly inside the building as well as outside, and may have had a Turkish employer inside who observed some of what was going on. Which is to say that the Turks certainly know exactly what occurred but are playing their cards closely to see what they can derive from that knowledge. The two countries have already initiated a joint investigation into what took place. Turkey’s economy is in free fall and would benefit from “investment” from the Saudis to create an incentive to close the book on Khashoggi. In other words, Turkey’s perspective on the disappearance could easily be influenced by Saudi money and the investigation might well turn up nothing that is definitive. Saudi Arabia, for its part, has a couple of cards to play also even if it did kill and dismember Khashoggi under orders from the Crown Prince. First of all, the system of petrodollars, which basically requires nearly all purchases of petroleum to be paid in dollars, is underwritten by the Saudis. Petrodollars in turn enable the United States to print money for which there is no backing knowing that there will always be international demand for dollars to buy oil. The Saudis, who also use their own petrodollars to buy U.S. treasury bonds, could pull the plug on that arrangement. That all means that the United States will be looking for an outcome that will not do too much damage to the Saudis. Second, Saudi Arabia is in bed with Israel in opposition to Iran. This means the Israel Lobby and its many friends in Congress will squawk loudly about Khashoggi but ultimately shy away from doing anything about it. It already appears that a cover story is halfway in place to explain what happened. It is being suggested that a “rogue” element from Saudi Arabia might have carried out without the knowledge of the Crown Prince an interrogation or abduction attempt that went too far. Donald Trump speculated on Monday that that might be the case, suggesting that it may already be part of the official line that will be promoted. Those who know Saudi Arabia well, however, consider a high-level assassination not ordered by the Crown Prince directly to be extremely unlikely, but that does not necessarily mean that a cover story including that feature might not be successfully floated. In regional terms, Saudi Arabia is also key to Trump’s anticipated Middle East peace plan. If it pulls out from the expected financial guarantees aspect, the plan will fall apart. Riyadh is also committed to buy tens of billions of dollars’ worth of American arms, an agreement that could be canceled if Washington begins to pressure the Saudis for answers. Beyond that, Saudi Arabia could stop pumping oil or fail to increase production when Iranian oil becomes subject to U.S. sanctions early next month, driving the price per barrel up dramatically for everyone. The Saudi government has already indicated that it will respond forcefully to any attempts to punish it over Khashoggi and there is no reason to doubt the seriousness of that threat. There are, of course, possible impediments to selling the fake news narrative. Some early reports suggested that Khashoggi’s fiancé had observed and possibly recorded the execution inside the consulate using the victim’s Apple wristwatch linked to an iPad in her possession. If that is true, the release of such material to the media will create worldwide demand to learn the truth that will be difficult to control. Also, there are unconfirmed reports that U.S. intelligence knew in advance of Saudi plans to abduct Khashoggi, which could prove embarrassing to the Trump administration and could narrow its options. The trick will be to see how a bit of extreme brutal behavior by the Saudis can be manipulated by all interested parties to produce a solution that doesn’t damage anyone too much. It will undoubtedly be far from the truth, but truth doesn’t necessarily matter much these days. Philip M. Giraldi, Ph.D., is Executive Director of the Council for the National Interest, a 501(c)3 tax deductible educational foundation that seeks a more interests-based U.S. foreign policy in the Middle East. Website is www.councilforthenationalinterest.org, address is P.O. Box 2157, Purcellville VA 20134 and email [email protected] He is a frequent contributor to Global Research. Featured image is from SCF.